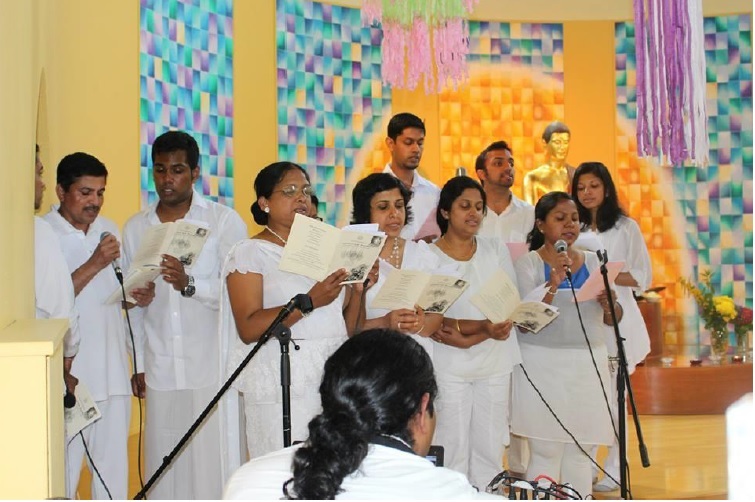 With the view of making the current generation aware of the significance of Poson, Sri Lankans living in and around Sheffield celebrated this event on 5th July 2014 for the third year running. 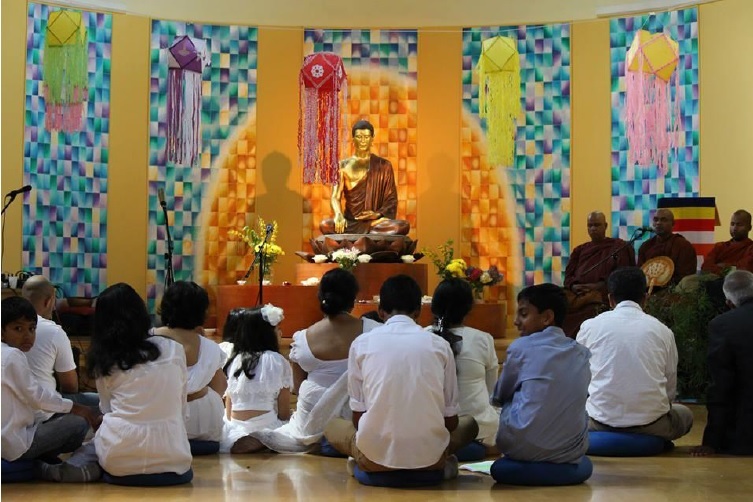 The event that was held at the picturesque Sheffield Buddhist Centre was attended by the Ven. Pidiwille Piyatissa Nayaka Thero and GalpoththayayePemanada Thero of Kethumathi Buddhist Temple in Manchester along with visiting monks Ven. Halmillewe Saddhatissa from Anuradhapura and Ven. Galpoththayaye Seevali. Everyone who attended from most northern cities of England and even some from London, enjoyed the peaceful, serene environment of Sheffield Buddhist Centre. The main hall was decorated by lanterns constructed by the younger generation. Layan Wijekoon, Sumal Keshawa, Prince Kevin, Seuwandi, Mangalika and others were seen rushing to prepare the main hall with lanterns and erecting the reconstructions by the artistic Sri Lankan students of the Sheffield Universities. These were the scenes of Ambasthale with breath taking figures of Arahath Mahinda, King Devanampiyatissa, the deer, the Ambasthala rock, the mango fauna etc. The proceeding started with Buddha Pooja, and alms giving to the monks prepared by Shatha Liyanage, and Mangalika with delicacies prepared also by @charith abhayaratne. Many others too provided dishes for the alms. At the onset there were also refreshments for the congregation. Then followed the main sermon by the visiting Ven. Halmillewe Saddhatissa from Anuradhapura who preached on the significance of Poson and the importance of Buddhist philosophy. Young Shehan and Senuri Tiththagala expertly enacted the Poson seen at Ambasthale. The Bhakthi Gee which followed started with a performance by the very young children viz. Jayani Wijekoon, Hesadu Devasundara, Hashini Liyanage and Sandali Rodrigo. The efforts of their parents in motivating & assisting these children are highly commendable which will contribute for the preservation of the Sri Lankan culture for future generations. Then followed the premier performance of two new songs one Peradina Wesange” by Madree Peramunugama a student from Musaeus College Colombo and Sadaham Sisilen” by Buddhi Mahipala a student at The University of Cranfield. There was also the song Wieetha Ragi” by Layan Asiri Bandara Wijekoon which had its premiere at our festival last year. The musical director was Layan Asiri Bandara Wijekoon and Sumal Keshawa assisted as his right hand. James Jayawardena also provided guidance, assistance and some equipment. 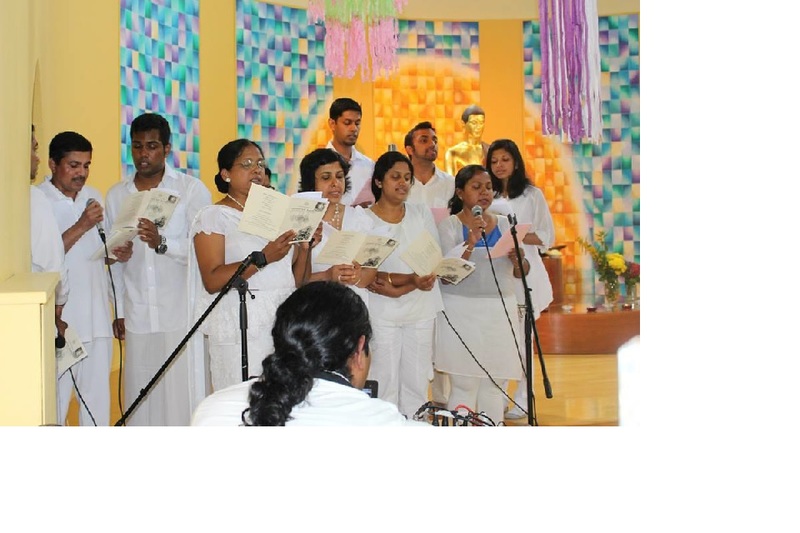 The main choir consisted of Panini Rodrigo, Shantha Liyanage, Nidarsha Wijekoon, Shiromi Aponso, Sumal Keshawa, Mangalika Jayawardena, Seuwandi from Leeds and Duleepa Jayasundara, Dushmantha Hennayaka, Mithila and Kumuduni from Stoke-On-Trent. The congregation joined in the singing with the lyrics in the excellently produced brochure. The minister of Consular Affairs and Immigration of the Sri Lanka High Commission of London, Mr. Sepala Rathnayake addressed the congregation stressing the importance of this sort of function to maintain and propagate the Sri Lankan and Buddhist culture and traditions among citizens living abroad. The Sheffield City Councillor Sarah Jane Smalley in her address commented on how much she enjoyed this event and expressed her pleasure to see these events being organised in Sheffield. The vote of thanks was by Thavidu Liayanage. The commendations should also be extended to Jayawan Wijekoon and Thushara Dewasundara who undertook and did the photography and video of the entire event with quiet efficiency. The event concluded with Dansala to which many contributed with their delicacies. Everybody thoroughly enjoyed the vegetarian Sri Lankan cuisine. These delicacies in a land far away from home were expertly prepared and kindly contributed by so many including Ranga Thenuwara, Panini & Shiroma Rodrigo, Jayathi Silva, Gayathri, Seuwandi, Kumuditha, Udaya, Karvindi & Sampath, Thiruni & Hasitha, Mahesh, Ayomi & Rakitha, Achini , Dinesh, Minosha, Kasun, Lali & Upali, Mangalika and others. The excellent Dansala overseen by Thiruni, Kavindi, Kasun Uduporuwa & Isura Herath was a success and turned out to be a leisurely networking event. Thanks must also go to the many that joined hands to clean and tidy up the venue. The guidance received from Lal and Mangalika Jayawardena in organising this event is much appreciated and it is that everybody’s wish that events such as these can be organised in the future which as per the current trend will become more and more popular and successful. This entry was posted on Thursday, July 17th, 2014. You can follow any responses to this entry through the RSS 2.0 feed. You can skip to the end and leave a response.